Bernal Spheres, Stanford tori and the return of the polis. This post was originally published on blogspot.com on April 23, 2012; updated June 13, 2014. In this post I want to share some thoughts I have had for many years, concerning the ancient Greek city-state, or polis (plural poleis) and what we can learn from them. 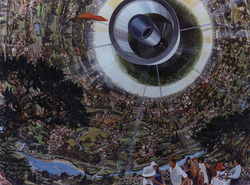 Both O’Neill’s Island I and its main competitor the so-called Stanford torus are designed for some ten thousands of inhabitants, roughly the population of many small cities. And since space habitants of this kind can easily moved to any place within our (inner) Solar system, they can enjoy a great amount of isolation just by keeping distance from other space colonies. 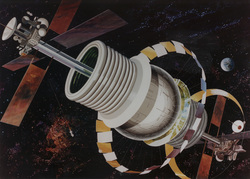 Furthermore the abundance of space resources makes economic self-sufficiency not only feasible but also very likely. Here on Earth no country can turn to a policy of full autarky without paying a huge price. Effectively only very primitive societies can be autarkic without giving up current wealth. One reason of modern globalization is that highly technological industries require large amounts of various resources, of which many are both rare and spread over different parts of the world. Some resources are as good as exclusively found at one place on Earth. Some argue that this interdependence promotes world peace, while on the other hand we see that competition of scarce resources actually lead to many international conflicts. In space there is a different situation, since there are a lot of recourse rich asteroids. Actually some “small” asteroids contains a few times more resources than anything ever dug up by Mankind, not only these asteroids have a huge abundance of resources but they also contain virtually all chemical elements needed by highly industrialized societies. A second difference is that competition among space colonies for resources will be low, due to great amount of asteroids, reducing tension among Spacer societies. We can easily imagine that a small space colony, type Bernal sphere or Stanford torus is located near a small asteroid (dimension less than 1km). Such space society will be economically and politically independent from any other state (whether Spacer or terrestrial). This comes very close to the ancient Greek ideal of the polis: a political independent community of a few thousand people and economically self-sufficient. Since the time of the ancient Greeks the ideal of small independent communities have repeatedly promoted by political activists. But these ideas and initiatives are repeatedly defeated in favour of the nation-state. A modern incarnation of this attitude is Communalism as conceived by Murray Bookchin. Bookchin, who stood in the anarchist tradition, opposed the nation-state, because it is undemocratic and a tool for corporate interest. Instead he argued that people should organize direct democracy at municipal level. And in a next stage, such municipalities should organize themselves into confederations, these confederations should compete with the Nation State for power. Confederations of municipalities differ from nations in an important way: the municipality is the primary political unit and the municipal citizens’ assembly is the Sovereign; the confederation is just an organization for cooperation and joint action by municipalities, and the representatives of the municipalities in the confederal council are purely coordinating and administrative. Personally I believe that Communalism and its aims are not realistic, on Earth, because nation states are too well-organized and most terrestrial people don’t care about politics in general, and specially they don’t care about the Nation State. I suppose that most readers of this blog have never heard about Communalism before. On Earth I see no future for Communalism and related ideologies, but in Space Communalism and its idea may play a major role. Although I am not a Communalist myself (mainly because I disagree with its anti-capitalist nature), I believe that Communalism can provide valuable insights on how to organize Space colonies. Some Space colonies may opt for Communalism, while other colonies will try other forms of government. But I believe there is a future for small polis based political communities in Space.